This is one of the strangest games I've seen for the Colecovision. 2010 is a series of puzzle games, wrapped in a space station repair mission. This is a game you can figure out how to play without reading the manual. That's good, because the instructions are a series of technical "transmissions to mission control" - realistic yes, fun to read, no. Upon starting the game, you see a diagram of the ship with detailed areas highlighted that are in need of repair. When you select an area, a close-up "circuit-repair" puzzle screen appears. I must admit that these puzzles are quite challenging and thought-provoking. Typically you guide a spark along circuits in a maze of computer chips, attempting to locate the correct path while avoiding wandering circles which are deadly to the touch. The mechanics owe more than a little to Qix, but this is nowhere near as fun. There's a certain sense of satisfaction that comes with becoming proficient at the puzzles, but after a while they grow tiresome. Eventually it all starts to feel like... work. The high-tech graphics and alarming sci-fi music do create an Alien-like tension, but there's no characters to care about and little fun to be had. And what does "The Graphic Action Game" in the title mean? One very astute reader pointed out that another 2010 game - a text adventure - was released at the same time for the Adam computer. © Copyright 2003 The Video Game Critic. If you're like me, you just can't get enough of penguin racing games. In this one, you view the "action" from behind your chubby little penguin as he waddles at breakneck speeds to reach the "ice station" (which flies an Australian flag for some reason) before time runs out. On the way he'll jump over holes and steer around walruses that stick their heads up. Bonus points are earned by grabbing green flags or snagging orange fish that leap from the holes. The quasi-3D illusion of movement is convincing enough, but there's little in the way of scenery. You control your penguin's speed as well as direction, and the jumping feels quite responsive, allowing you to hop with precision over closely-spaced holes. I especially like how the penguin's momentum pushes him to one side when cornering. Antarctic Adventure is mildly amusing for a while, but it's really a one-trick pony. The ten stages are all pretty much the same, except with shorter timers that force you to make faster and faster runs. I think the game would be better if you were racing against other penguins, not just the clock. The one thing I absolutely hate is the cutesy "Skater's Waltz" tune that plays incessantly throughout the game - very annoying. Antarctic Adventure is certainly a good-looking game, but I just didn't find the gameplay particularly appealing. © Copyright 2003 The Video Game Critic. This is a recent port of a not-so-classic-but-definitely-old arcade game by Stern (1980). I had never even heard of this shooter before, but Astro Invader has a real Space Invaders vibe - even borrowing the "cadence" sound effect. You control a cannon on the bottom of the screen as aliens are relentlessly deployed from a large mothership at the top. These aliens slide down into chutes where they sit for a short period of time. This "chute" concept is one I've never seen before, and if I'm lucky, I'll never see it again. Once the aliens begin to fall out of the chutes, they splatter on the ground, posing a deadly hazard. You'll also need to contend with descending pink saucers that will cost you a life if they land. Shooting these saucers triggers an awesome "wah-wah-wah" echo effect, which is hands-down one of the best audio effects I've ever heard! Objects are rendered in solid colors, but scenery is painted in a rainbow of colors which is pleasing to the eyes. Sadly, Astro Invader looks better than it plays. The game is only moderately fun, and there's not much strategy besides staying near the center of the screen. The cartridge is not glitch-free, and the collision detection (especially near the splats) is questionable. What makes the game worthwhile is its high difficulty, which keeps the games short and makes you want to give it another try. In addition, Astro Invader has a certain old-school quality that is known to trigger flashbacks to 1980. © Copyright 2007 The Video Game Critic. Quest For Tires was very impressive in the early 80s; with its huge, multi-colored characters and scenery -- taken straight from the B.C. comic strip. Your caveman character rides a stone wheeled unicycle through a series of side-scrolling stages. The graphics are outstanding, with smooth scrolling and clever animations (although the "crash" sequence looks pretty sloppy). The first few stages offer simple challenges like jumping over holes and ducking under trees, but later stages will have you hopping between the heads of dinosaurs, catching a ride on a large bird, and jumping a ramp across a huge canyon. The controls are quite responsive and you can adjust your speed using the side buttons. Speed control is key to completing some stages, but it also serves to allow veterans to whiz through those easy early stages. One noticeable flaw is that your speed doesn't reset between stages, so if you were going full bore at the end of one stage, you're thrust into the next one at the same breakneck speed. BC's Quest offers simple arcade fun in a cartoon world. It's occasionally frustrating, but more often addicting. © Copyright 2001 The Video Game Critic. The first Quest for Tires game was a refreshing side-scroller with wonderful graphics and addicting gameplay. This sequel retains the same style of graphics, but diverges from the simple "forge-ahead" gameplay that made the first one so compelling. Grog's Revenge is non-linear and needlessly complicated. You spend most of the time navigating the ledge of a narrow cliff, and it's very easy to fall off the side. Your goal is to collect more clams than another character that looks like a big hairy Muppet, whose location is indicated on a confusing radar screen. Most of the game is spent riding around on a wheel trying to run over tiny clams that you have to be perfectly lined up with. The rest of the game is spent exploring dark caves, and this is when the game goes from bad to worse. Moving vertically up the screen, you guide a cone-shaped "headlight" from side to side trying to collect clams while avoiding rocks and other hazards. Not only is this zero fun, but it looks like total crap. When you finally complete a level, it's off to the next cliff for even more aggravating escapades. The only innovative feature in Grog's Revenge is the ability to "warp" to different levels, but it's pretty useless in a game this bad. Grog's Revenge resembles the first game by name alone, so don't be fooled. © Copyright 2002 The Video Game Critic. In this second-rate Tempest, you control a cannon at the bottom of a moving grid in space. The blue grid looks attractive, but mainly serves as eye candy. Your cannon can hop between five beams, attempting to shoot 15 scaling aliens while dodging indestructible meteors. In addition to your normal shot, you also have a reserve of long-range torpedoes. Be sure to save one or two of these for the mother ship, which creeps slowly across the top of the screen at the end of each round. The audio effects are very nice, reminding me of an Alien movie. But despite high marks for presentation and control, the gameplay is barely average. There's not much in the way of strategy and the action gets repetitive. © Copyright 2002 The Video Game Critic. If you were playing video games in the early 1980's, you may remember how so many game developers were attempting to recreate the classic trench scene from the first Star Wars movie. Buck Rogers is one of the less successful attempts. It would be easy to blame the technology of the time, but in truth, this shooter is rife with design flaws. The graphics aren't too bad. Sure, the scaling is rough and the rockets resemble blue pineapples, but the visuals do convey a modest degree of depth. The problem is, although your ship has a shadow to indicate its altitude, enemy UFOs and incoming bombs do not. Consequentially, it's practically impossible to tell whether you're "lined up" with a target. All you can do if fire wildly and continuously, hoping to hit something - somehow. And sometimes that strategy is good enough. I did discover that the chances of blasting a UFO are much better when you hover at the very bottom on the screen, despite the fact that the UFOs appear to be much higher. To its credit, Buck Rogers does offer seven distinct stages, taking you into trenches, over planet surfaces, and through deep space before facing the Command Ship boss(!). After defeating the impressively large (but weak) boss, you're rewarded with the text "Nice play. Go on." Buck Roger's audio is equally lame, and its "musical score" (I'm being loose with the language here) sounds like a two-year-old pounding on a Casio keyboard. It's interesting to see all of the stages in Buck Rogers, but once you've done that, the game doesn't have much left to offer. © Copyright 2006 The Video Game Critic. Bump n Jump was one of several exciting overhead racers in the early-80's arcades. Its concept is a recipe for fun. Not only can you run cars off the road, you can propel your vehicle high into the air, landing directly on top of them! So what's the deal with this lame Colecovision edition? The controls are sluggish and the gameplay is downright laborious. You'll strain your wrist just trying to stay on the road. When you touch another car you totally lose control for seconds at a time. Taking to the air is fun, but it's hard to judge where you'll land because the framerate is erratic. When the road narrows you'll want to brace yourself for the inevitable "bridge out". Jumping bridges is bad enough, but whose idea was it to put that annoying green bush at the end of the road? I always run right smack into that [expletive] thing! Just when it seemed all hope was lost, I busted out my steering wheel controller. What a relief! Spinning the wheel is far more comfortable than wrestling with a stick and flooring the accelerator pedal means one less button to worry about. I recommend the "one finger twirl" technique for steering, although the wheel spokes can be a little rough. You jump by moving the joystick in any direction but that could be more responsive. The background music is melodic and I like how the stages reflect all four seasons. This may not be my favorite edition of Bump n Jump, but if you own the steering wheel go ahead and bump up the grade by a letter. © Copyright 2016 The Video Game Critic. Oh yeah, this one is a winner. BurgerTime for the Colecovision is easily the best home version I've played, and it even gives the arcade a run for the money. With its meticulously detailed graphics and arcade-perfect gameplay, I really can't find any flaws with this one. The object is to move a chef around a series of platforms, walking over burger ingredients, causing them to drop below and form a complete hamburger. You are pursued by nefarious gang of food items including hot dogs, eggs, and pickles. They'll converge on you quickly, unless you drop food on them or temporarily stun them with pepper. The game has a Dig Dug flavor to it. BurgerTime is considered one of the more difficult arcade games of the early 80's, but this version lets you choose between four skill levels. At first glance I thought the game could have taken up more of the screen, but once I saw the high-resolution characters, I had no complaints. These hamburgers look good enough to eat, and the way those hot dogs swagger around, you can tell they mean business. Unlike some lesser versions, in this game the pepper is "contagious" between bad guys, which is a good thing. But don't toss that pepper around carelessly - once you run out, you can go through many lives in a hurry. © Copyright 2003 The Video Game Critic. If you're a child of the 80's, you'll recall that the Cabbage Patch Kids dolls were the hot item that kept Coleco alive, even after the Colecovision faded and the Adam tanked. This rarely-sought-after game features one of those hideous dolls navigating a series of Pitfall-inspired screens. You'll swing on vines, jump over puddles, dodge bouncing apples, and things of that nature. The challenges are fun at first, but do get repetitive after a while. Still, the control is good and the cartoonish graphics aren't half bad. There's even a happy theme song that plays in the background, and it reminds me of Frogger. Cabbage Patch Kids isn't a bad game, but to be frank, there's nothing here to get excited about. © Copyright 2001 The Video Game Critic. Don't make the mistake of overlooking this oldie because it's a heck of a lot of fun. About as old-fashioned as you can possibly get, Carnival lets you move a gun across the bottom of the screen, aiming at three rows of moving ducks, bunnies, letters, and bonus items. You have a limited number of bullets, and once your supply is depleted the game ends abruptly. Remaining ammo is lined across the bottom on the screen, and low-flying ducks will actually swoop down and "eat" into your precious supply. If you ever wondered what it is that ducks eat, now you know it's bullets. Who says video games can't be educational? It's possible to replenish your ammo by shooting boxes with numbers on them. A wheel of "pipes" rotates at the top of the screen, and you'll want to clear those out first, as their point values count down quickly. A large box on the top left periodically contains bonus bullets and points - just don't shoot it when it's displaying negative points! I always felt a second box was needed on the right side in order to balance things out, but instead the right side is used to keep track of your B-O-N-U-S letters, which you need to hit in order. Carnival's graphics are bright and cheerful, and I even like the old-fashioned carnival music. Upon clearing each level, you're treated to a cool "shoot the bear" bonus stage, which lets you pump as much lead as you can into a moving bear. Back in the day, I remember how kids at the local bowling alley thought "shooting the bear" was the greatest thing in the world - and they were right! Subsequent bonus stages even let you take aim at two or three bears. Carnival is a simple, no-frills arcade title that even females have been know to take a liking to. © Copyright 2006 The Video Game Critic. Centipede is indisputably one of the greatest shooters of all time, and this version is outstanding. Strangely enough, Atari seemed to make the best versions of its games for other consoles. The cannon, bugs, and mushrooms objects are extra large, and the animation is silky smooth. Using Colecovision's Roller Controller (trackball) is a pleasure, giving you lightning-fast movement and pinpoint accuracy. The action is relentlessly fun and incredibly addictive. Even women tend to gravitate towards this game - probably due to their disdain for bugs! The huge, hideous spider is a bit slower here than in other versions, but he also tends to linger near the bottom of the screen -- preventing you from getting a good shot at him. The scorpion shows up early and often, and at 1000 points, he's always worth taking a shot at. By poisoning the mushrooms, he indirectly leads to most of your deaths. Centipede has three skills levels and comes with my highest recommendation. © Copyright 2008 The Video Game Critic. Coming fresh off my review of Chuck Norris Superkicks (Atari 2600, 1983) this Colecovision edition was exactly what I expected. 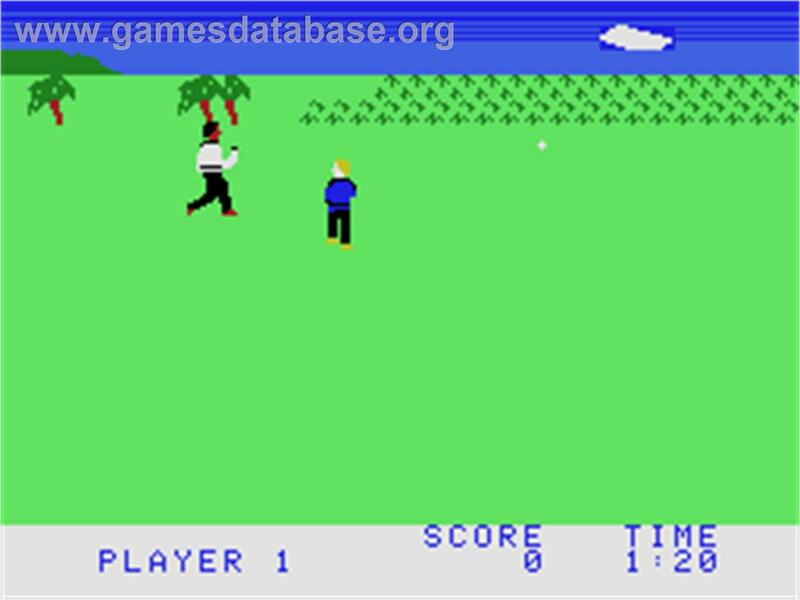 It's the same game except with larger characters, detailed scenery, and stiffer controls. Your guy is a dead ringer for Chuck Norris and I love that spiffy blue uniform. When performing kicks I like how he turns his body sideways in a realistic manner. As you walk up a branching trail the scenery is rich with farms, forests, rivers, stone bridges, and mountains. This is a good-looking game! Trying to stay in that narrow path can be pretty painful however as you wrestle with the rigid controller. During the fight sequences you'll battle preppy guys in Izod sweaters who throw stars like a girl. The collision detection is forgiving as you unleash punches, thrust kicks, and his patented Superkick. If you're familiar with the Atari 2600 game you'll have no problem picking up on this one. The thing is, executing precision movements with the Colecovision controllers will take its toll on your hand. The approach to the final monastery stage is quite a sight as the majestic building rises before you. Only after beating about 30 blinking ninjas inside did I learn that Superkicks doesn't even have an ending! My wrist is still killing me! Much like Chuck Norris himself, this game will teach you the meaning of pain. © Copyright 2018 The Video Game Critic. With colorful, pseudo-3D graphics, Colecovision's Congo Bongo made Atari 2600 fans of the early 80's green with envy (including me). The game stole a lot of ideas from Donkey Kong, but gave them a whole new dimension (literally). In the first stage, your explorer must climb a tiered cliff to reach the nasty ape at the top, named Congo Bongo. Along the way, he'll have to dodge coconuts, cross a bridge, slide down a hill, leap chasms and avoid monkeys. The detailed graphics are an eyeful, although I would have much preferred a green color scheme instead of the ugly yellow/orange one. The splashing blue waterfalls look beautiful, and minor details like the little skull in a corner gives this game charm. Although the monkeys are mostly an annoyance, if two of them get a hold of you, they can hoist you over their heads and hurl you off the cliff! If only the other two stages were as interesting as this one! The second stage is much less imaginative, featuring a wide-open savannah with charging rhinos all over the place. There are some holes to take cover in, but I've found that if you just jump a lot, you won't even need to use these. The last screen resembles a 3D Frogger, where you need to cross water by hitching rides on lily pads and hippos. This screen is attractive enough, but I found it frustratingly difficult. Worse yet, there's no payoff for reaching Congo for the third time - it's just back to the beginning of the game. Despite the uneven gameplay, Congo Bongo is a challenging, good-looking title. © Copyright 2003 The Video Game Critic. I was overly harsh in my initial review of this game, unfairly comparing it to Scramble (a long-time favorite of mine). Cosmic Avenger is one of the more action-packed, challenging titles you'll find on the Colecovision. A side-scrolling shooter, you fire missiles at enemy rockets and ships (many shaped like Tie Fighters) while dropping bombs on ground installations. There are a lot of objects on the screen at a given time, and the action is intense! Usually I prefer to play Colecovision games on skill level 3 (arcade level), but in this case I found it nearly insurmountable. As you move your ship towards the right side of the screen, you speed increases. While this may seem tempting, I'd highly advise against it because the frame-rate becomes choppy and the screen too chaotic. Staying to the left and taking a slow, deliberate approach works better. I actually found it effective to hold in both buttons to fire nonstop. Sometimes you'll find yourself pursued by heat-seeking missiles, and I love how you can make them collide with other projectiles. That's a pretty advanced concept for an oldie like this! On the downside, Cosmic Avenger's collision detection is erratic, and I don't like is how touching an explosion will destroy your ship. In better shooters (including Scramble) it's always satisfying to fly right through the debris. Also, during the "underwater" stages, the high-pitched sonar "pings" got on my nerves after a while. 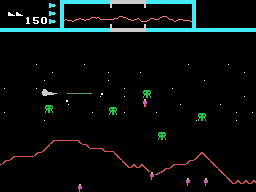 Still, Cosmic Avenger provides a very exciting brand of space shooting action, and it's fairly addictive as well. © Copyright 2006 The Video Game Critic. If you appreciate simplicity in video games, Cosmo Fighter 2 is as simple as they come. You move a cannon side-to-side across the bottom of the screen as assorted objects rain down at various speeds. The game has an appealing arcade look (circa 1982), complete with cycling demo screens displaying directions and point values. You'll face beakless birds (last seen in Atari 2600's Phoenix), heat-seeking Chinese noodles (my interpretation), and bouncing red hourglasses. There's even a big mother ship, although the chances of seeing that thing (outside of the demo screen) are slim. For such a basic shooter, Cosmo Fighter 2 has a hell of a lot of things wrong with it! For starters, the background features descending planets and stars that blend in with dangerous aliens and missiles! You can fire your cannon rapidly, but pressing the button continuously is hell on your thumb, and your cannon tends to "cut out" periodically for reasons I have yet to discern. The "beginner" skill level is insanely difficult, and the unforgiving collision detection certainly doesn't help matters. The sparse audio features some ear-piercing sound effects that are none too pleasant. When I asked my friends to describe this game, they replied with "Not good". Cosmo Fighter 2 has one thing going for it, and that's challenge. You'll be lucky to last for two minutes, yet you'll keep coming back for more. Colecovision die-hards should check this out, but Cosmo Fighter 2 is just too sloppy to recommend to casual gamers. © Copyright 2008 The Video Game Critic. 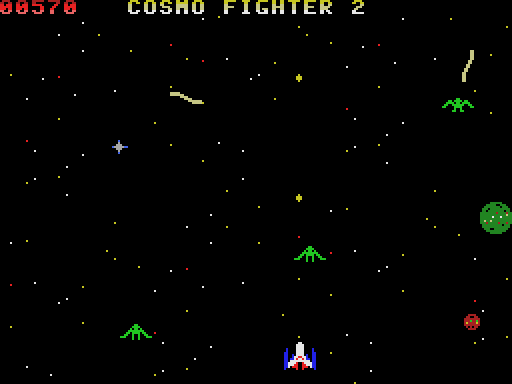 Cosmo Fighter 3 is a vertical shooter with aliens that emerge from the top of a vertically-scrolling screen. The background graphics feature walls, forests, and lakes, but they look extremely grainy and the colors are ugly. Making matters worse is the jerky scrolling that's not at all pleasing to the eye. Each wave of aliens move in a distinctive manner, including some that drop down quickly but high-tail back before you can get them lined up for a shot. The aliens are so much faster than you that shooting blindly is your only option. Your ship fires two missiles at a time, but the fact that you have to pound the fire button continuously will absolutely kill your forearms. The challenge is there, especially when dealing with the first boss who teleports all over the screen. The background music has a happy-go-lucky vibe that doesn't seem to fit with the theme. I do like the game's opening sequence, which shows a spaceship landing on a partially-destroyed Earth. Cosmo Fighter 3 seems playable at first, but in the long run proves painful and unsatisfying. © Copyright 2008 The Video Game Critic. Dam Busters was a difficult game to review, even harder to play. The instructions read like a military operations manual, and come with plenty of extra "official" looking documentation (makes me sleepy just to look at it). The apparent objective of this first-person simulation is to fly a fighter plane over enemy territory and blow up dams. Each button on the keypad brings up a different view, similar to the scheme used by B-17 Bomber on the Intellivision. Unfortunately, the game takes place entirely at night, so there's not much to see except a bunch of white pixel "lights". The controls are extremely complicated and require hours to master. Dam Busters is one of those titles for people who love to pore over details. Personally I found it to be hopelessly confusing and dull. © Copyright 2000 The Video Game Critic. 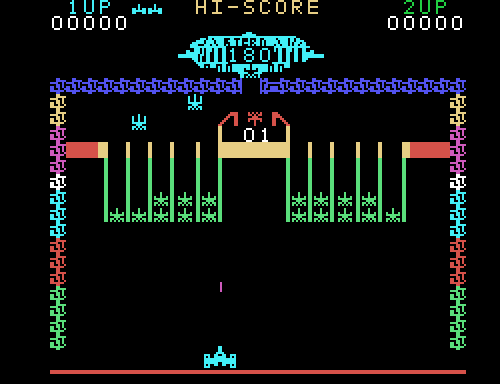 Defender was ground-breaking in 1981 and few side-scrolling shooters have ever matched its intensity. Even its sequel Stargate (Atari 2600, 1984) failed to generate the same level of excitement. I recall a Defender arcade machine at my local Highs convenience store when I was a child, but I rarely played it because I could never last for more than a minute or two. Thank goodness we had home versions to save us the public humiliation. Defender is tough! As you fly over a jagged landscape you blast aliens that abduct humanoids from the surface and transform them into spastic mutants. The programmers were really on the ball when they made this. The scrolling is so smooth - a rarity for the Colecovision. Your sizzling lasers pierce multiple aliens at a time and when your ship takes a hit its blooming explosion is a sight to behold. Your ship doesn't shoot fire out of its exhaust, but hey - you can't have everything. There are a variety of enemies distinguished by their own unique sound effects. Most dangerous are the pods which unleash groups of tiny red "swarmers". When the screen is crowded that's usually a good time to detonate one of your smart bombs via the right trigger. Hyperspace, always a last resort, is relegated to the "0" button on the keypad, which means you'll never use it. What's not to love about this game? Well, the controls feel stiff and when you change direction your ship becomes immobile as it reorients itself. The single skill level is ideal for beginners, but the generous free lives and bonus smart bombs can drag things out for experts. Still, Defender is an undeniably impressive arcade port for the Colecovision. © Copyright 2016 The Video Game Critic. Have you even heard of a "must-have" game for a system? Well, Destructor is the opposite of that. Trust me, this cartridge will do nothing but take up valuable space in your collection. Had Coleco not been so hard-pressed for another title to support their Driving Wheel controller, this dreadful piece of excrement would have never seen the light of day. Destructor offers an overhead view of a small tractor you steer around a scrolling maze. The title of the game is utterly misleading, as the crux of the "action" involves finding crystals and hauling them back to your "starcruiser" (which resembles a psychedelic shack). You'll be pestered by wandering bugs, but these are easy to avoid. The instruction manual seems to indicate there's some underlying strategy involved, but it never became apparent to me. The sprites look awful, the screen scrolls in a choppy manner, and unsightly artifacts litter the screen. The crystals and bugs seem to appear at random, giving you little incentive to wander far from your shack. The audio is equally horrendous, with all sorts of irritating beeps and blaring sirens. Once you gather enough crystals, you're off to the next monotonous level, which looks and plays just as poorly. Destructor is one of the those games that's so pointless that you switch it off well before depleting your lives. © Copyright 2006 The Video Game Critic. Having Donkey Kong as its pack-in game was a huge coup for Coleco. In 1982 gamers were hungry for "arcade quality" graphics and this home version delivered big-time. The game also introduced two of the most beloved characters in the history of video games, with Mario and Donkey Kong meticulously rendered in three colors each. The three screens are fine renditions of their arcade cousins, with only minor alterations. Die-hard fans will notice a missing girder here and there, but the elaborate elevator screen looks just as amazing as it did in the arcade. The controls are a little stiff, but tapping the joystick to scoot up and down ladders is a very effective technique. The collision detection can be a little fishy, especially when you're trying to grab the hammer and you jump right through it. Is it even possible to grab that hammer on the left side of the rivet stage? While holding the hammer you become completely invincible - unlike the arcade. This game has been surpassed by subsequent editions on other systems, but let's face it - you can't take the fun out of Donkey Kong. © Copyright 2012 The Video Game Critic. Donkey Kong Junior manages to live up to the legacy of its predecessor without feeling like a rehash. It introduces bold new concepts while faithfully preserving the charm and spirit of the original groundbreaking platformer. This time the tables are turned, with Donkey Kong being held captive in a cage. Coming to the rescue is the diaper-clad Donkey Kong Junior, who is nicely rendered in five colors. Mario now plays the role of the villain, and he looks like a little cowboy. Instead of climbing ramps and ladders, the gameplay mostly consists of sideways vine-climbing in jungle environments. Enemies include chattering teeth and egg-dropping birds which can be defeated by dropping fruit on them. The second screen requires you to climb chains to unlock your father's shackles. A rope snaps as you unlock each padlock, and it's a neat effect you won't find in any of the other home versions. Three of the four screens from the arcade are included, with the electrified level having been omitted. Each stage provides a fresh set of challenges, and the game is arguably harder than Donkey Kong. Brimming with innovation and vibrant visuals, Donkey Kong Junior is one of the more underrated sequels of all time. © Copyright 2012 The Video Game Critic. 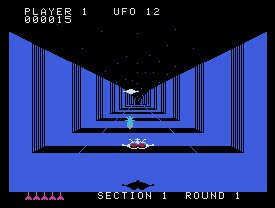 If you enjoyed the Atari 2600 version of this game, you owe it to yourself to check out Dragonfire for the Colecovision. Imagic really went beyond the call of duty for this one. The first screen displays the exterior of a castle (with bridge), plus attractive, shimmering water in the moat below. You must enter the castle while avoiding fireballs coming from inside. If you get hit, you'll splash into the water below. In later stages, there's also a retracting bridge and an archer in the tower to complicate matters. Once you make it inside, you see a 3D view of the treasure room, with a menacing dragon at the bottom of the screen. As you franticly run around collecting treasures, your prince actually scales in and out. My only complaint is that the treasure items that looked so nice in the 2600 version are plain and single-colored here. In later stages a troll patrols the treasure room, adding to the challenge. Dragonfire has ten skill levels, and although it's tough, the controls are perfectly responsive. This game has it all. There's even a nice title screen showing a princess in the tower and the dragon peeking out of the gate. © Copyright 2001 The Video Game Critic. 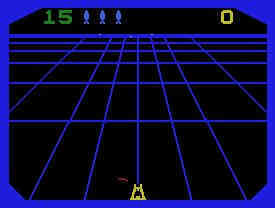 Here's a very primitive first-person driving game that makes use of the Colecovision steering wheel controller. While ambitious as hell considering the system, Dukes of Hazzard is far too clunky in the control department to merit an average grade. The object is to elude Boss Hogg while chasing down a blue car driven by some lawbreaking redneck. You get a clear view of the road above your dashboard, and remarkably, there's even a working rear-view mirror! Unfortunately, the jumpy framerate and choppy scaling make it hard to steer with any degree of precision. You'll be swerving from side-to-side so much that avoiding head-on collisions requires more luck than anything else. It's such a struggle to remain centered on the road that the whole chase element becomes secondary. Graphical glitches don't help matters, including oncoming cars that appear to be approaching from the right, but then suddenly jump to the left. Regulating your speed using the H-shaped gearshift is also tricky. The scenery is fairly impressive, with occasional trees, streets signs, intersections, and even a few single-story buildings in the downtown area. But the highlight of the game is definitely bridge jumping, which can only be done if you're exceeding 75 MPH. I can appreciate what Coleco was trying to accomplish with Dukes of Hazzard, but the technology wasn't quite there yet. It's a playable game, but the problematic controls wear thin after one or two plays. © Copyright 2006 The Video Game Critic.